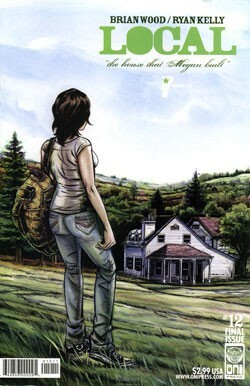 When Brian Wood was finishing up Local, a comic-book series featuring a young female protagonist and her adventures around the country, he couldn’t help but include something about his home state in the final issue. Wood, born and raised in Essex Junction, currently resides in Brooklyn, New York. There he writes comic books and graphic novels, some of the violent, action-packed variety and others focusing on character development. The 12-part series Local, illustrated in dramatic black-and-white by his friend Ryan Kelly, is one of the latter. Fans of the comics genre may be more familiar with Wood’s work on such series as DC/Vertigo’s DMZ, which envisions a futuristic America engulfed in civil war, than with less traditional comics such as Local or Demo, in which regular citizens realize they have super powers. “Local and Demo definitely sell for far less,” the writer concedes. “However, I think people relate to them a lot more because they are so much more personal.” Unlike the typical superhero comic, these place the reader inside the characters’ lives in direct and intimate ways. Brad Searles, a childhood friend of Wood’s and a longtime reader, agrees. “Every issue in the whole series is based on a place that [Wood] or Kelly has some connection to,” says Searles, who was active in the local music community before relocating to Boston. Though he doesn’t usually write about Vermont, Wood says, he’s drawn inspiration for some work from the time he spent in Burlington during his youth. After high school, Wood moved to New York City and attended the Parsons School of Design. There he got into the comics world, and never looked back. But as the Local series approached its end, Wood decided Megan would settle down in Vermont. After bouncing around the U.S. and Canada, sorting through relationships and her own identity along the way, the character finds herself on Church Street — local residents will recognize the Marketplace in the illustrations. She also discovers that she’s inherited, from her mother, a rural retreat in the Green Mountains. For his part, Wood — now 36, married and the father of a 2-year-old daughter — still enjoys living in Brooklyn, “where I’m surrounded by my peers and fellow artists.” Yet he suggests he may someday follow his fictional character back north.